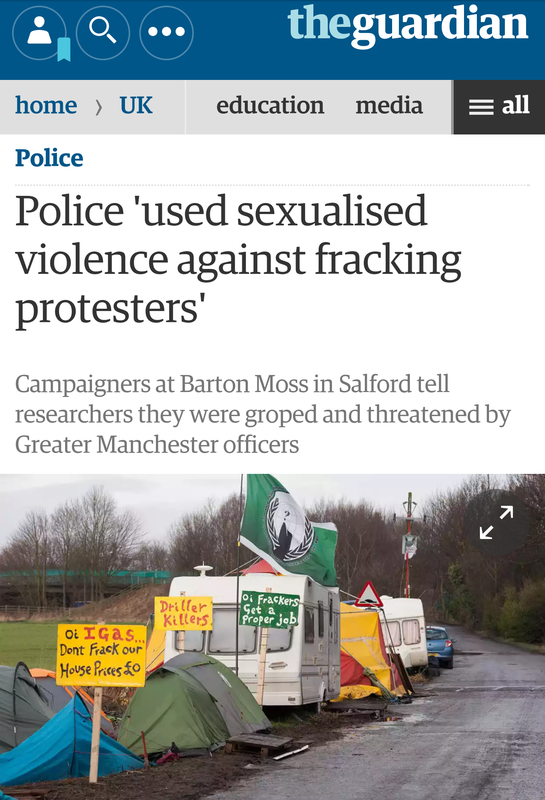 The Salford Star on the community resistance to fracking in the Winter of 2013/14 at Barton Moss Salford Greater Manchester…. 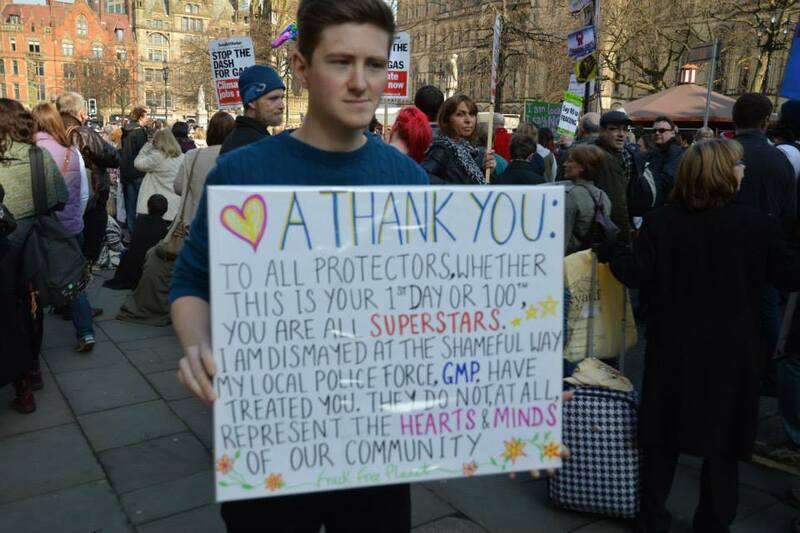 “About ten minutes into the slow lorry walk the regular officers who had been policing the peaceful protest were replaced by the Greater Manchester Police Tactical Aid Unit (TAU), which seemed determined to cause alarm and distress by forcing people to “walk” at a ridiculously fast pace, creating a stampede situation. “I’m a local resident, a peaceful person, I’ve never demonstrated before in my life, I’m not a politically aware person, just easy going, believe the Government, believe people, but do you know what? I am staggered by what I’ve seen. It breaks my heart. I came down, watched it go by stood on the side and just cried watching the police just pushing people down the footpath”. This was just one account from one witness to the extreme brutality that was meted out on a daily basis to ordinary everyday people objecting to fracking in the heart of their community amongst their children and loved ones. It’s one of the most deplorable untold stories in the social history of these islands but the truth will finally be coming out this week. This will not be the “truth” as told in one of the most shocking cover ups witnessed for many years when the Greater Manchester Police and Crime Commissioners “independent panel” report into the policing at Barton Moss was slammed by Solicitor Simon Pook for declaring that “claims of police violence have not been substantiated” when all anybody has to do to this day is search YouTube “police brutality barton moss”. The real truth will be told this week by a group of academics at the launch event of “Keep Moving!” to be held in Manchester on the 24th and Liverpool on the 25th. I personally have no idea who these people are but I don’t doubt that they are among the many thousands of people who witnessed the events at Barton Moss and having been sickened to the bottom of their stomachs decided that they couldn’t let such abhorrent behaviour go unchallenged. All I know is that “all that is necessary for the triumph of evil is that good men do nothing” and it looks as though some “good men” are finally doing something. This is also on the back of District Judge Richard Sanders recent slating of the police conduct at Barton Moss in finding two defendants not guilty being “entitled to demonstrate, were entitled to walk along Barton Moss Road” them having been pointlessly dragged through the courts like many many others. Most of these pointless court cases have now collapsed, two years later, with folk having had that permanent weight on their minds throughout this time. This isn’t a matter of historical record though, indeed, it’s even more relevant today than perhaps it was when this whole episode was subject to an insidious national media censorship as a multitude of British Isles communities are currently under attack from the evil fracking industry. From County Antrim in Northern Ireland to North Yorkshire on the mainland down to Surrey in deep England the drills are going in and brave folk will inevitably resist. The police will be using exactly the same tactics there as they did at Barton Moss which they imported from Balcombe as they only seem to have one gear, the no expense spared facilitating of a dangerous industry in the face of overwhelming opposition of the people who they are sworn to protect. These brave British communities will now be able to see the full reality of what they are about to face. They will be dismissed as “campaigners” and “protesters” with the mainstream media doing its very best not to mention that in reality it will be local people trying to defend their land and loved ones. When they attempt to peacefully protest they will have their basic human right to do so trampled all over with violent arbitrary arrests, ridiculously prolonged police cell time and area banning orders in an attempt to thin the ranks of objectors at the fracking site. 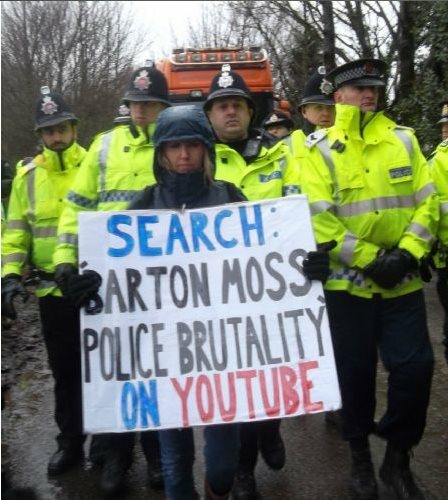 The police may even be accused of operating smear campaigns as at Barton Moss but worst of all the local Police and Crime Commissioner may instigate a whitewash inquiry into events. Worst of all because that’s such a despicable and dismissive insult to the people who have clearly witnessed the most disturbing scenes and been through the kind of trauma that no peaceful British community should ever have to go through. But maybe in the fullness of time some angels will come along who will not be able to stomach such injustice and just like at the Friends Meeting House in Manchester this Wednesday where the truth will come out for the heroes of Barton Moss, the true story will also be openly told about all of the brave people who have put their bodies on the line to defend this land against the foul fracking industry.